Washington, February 28, 2018 – The Carbon Pricing Leadership Coalition (CPLC), an initiative that brings together leaders from government, business, and civil society to drive carbon pricing action around the world, announced today the launch of the first CPLC Research Conference on carbon pricing to take place in late January 2019. Over the past several years, the world has seen a proliferation of carbon pricing schemes and an increase in the diversity of approaches. Research has underpinned much of this progress and helped increase the understanding of carbon pricing design. Despite this growing body of experience and data, new research and analysis are needed to support effective carbon pricing design and execution. The CPLC will convene researchers, policy makers, and practitioners at this international research conference to strengthen the knowledge base on carbon pricing and foster an improved understanding of the evolving challenges to its successful application. Leveraging its high-level membership of governments, private sector, and civil society organisations, the Coalition will draw on outcomes of this conference to help bridge the existing gap between theory and practice, and to inform future decisions taken by policy makers and corporate leaders. “We want to have a real, evidence-based conversation between practitioners, academia, policy makers, business leaders, and other sectors of society to provide answers to the difficult questions that all of them are asking around carbon pricing” said Andrei Marcu, Co-Chair of the conference and its scientific committee, and Senior Fellow International Center for Trade and Sustainable Development (ICTSD) and Director of the European Roundtable on Climate Change and Sustainable Transition. “We are looking to hear about interesting projects and outputs from across a wide spectrum of disciplines going beyond the usual fields already working on carbon pricing. For example, we would like to hear from researchers on corporate strategy or others working on the relevance of carbon pricing for business and the financial sector. We are particularly interested in a strong turnout from developing countries as well as from a younger generation of researchers and practitioners” said Michael Mehling, Co-Chair of the conference and its scientific committee, and Deputy Director, Center for Energy & Environmental Policy Research (CEEPR), Massachusetts Institute of Technology. Emerging frontiers of carbon pricing: Linkage and convergence of carbon pricing systems, policy transfer and diffusion across jurisdictions, extending carbon pricing to new sectors (aviation, shipping, agriculture and forestry), carbon pricing under the Paris Agreement (e.g. operationalisation of Art. 6 and NDC (Partnership) support), etc. 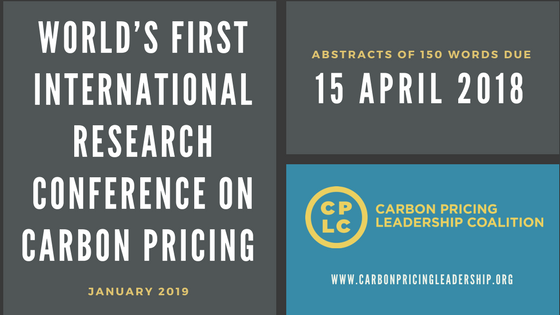 Abstracts of 150 words are due by April 15th 2018, and should be submitted using the form on the website: https://www.carbonpricingleadership.org/cplc-research-conference-call-for-papers/. All submissions will undergo review and selection by a Scientific Committee, with eminent representatives of academia, government, and private sector. Selection decisions will be communicated by May 31st, 2018, and full papers for conference presentation will be due by October 31st, 2018. Conference proceedings will be published in an edited volume and/or a high-impact, peer-reviewed journal. The Carbon Pricing Leadership Coalition (CPLC) is a voluntary initiative that works to catalyse action towards the successful implementation of carbon pricing around the world. It is a global coalition of national and sub-national governments, businesses, civil society organizations, and academic institutions working to introduce and expand carbon bring policies, share experiences and enhance global, regional, national and sub-national understanding of the emerging practices in the design and implementation of carbon pricing initiatives.